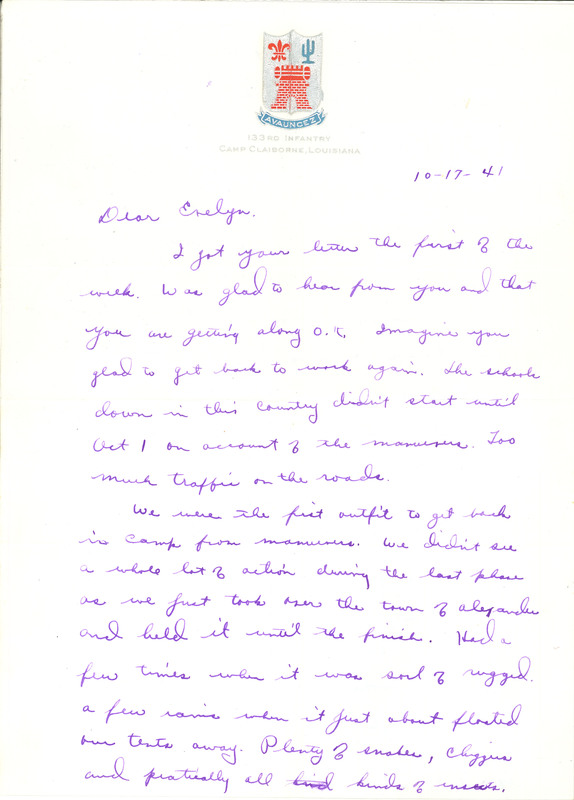 Camp Claiborne, Louisiana 10-17-41 Dear Evelyn, I got your letter the first of the week. Was glad to hear from you and that you are getting along O.K. Imagine you glad to get back to work again. The schools down in this country didn't start until Oct 1 on account of the manuevers. Too much traffic on the roads. We were the first outfit to get back in Camp from manuevers. We didn't see a whole lot of action during the last phase as we just took over the town of Alexander and held it until the finish. Had a few times when it was sort of rugged. a few rains when it just about floated our tents away. Plenty of snakes, chiggers and practically all kinds of insects.